Constantly pushing the membrane of the musical norm, this Denver-based quartet defies definition, as well as Denver's musical reputation. Four diverse musicians converge to produce an innovative, yet hauntingly familiar resonance. Never banal, never predictable, the music of Orbit Service blends exploratory electronica with traditional instruments, ranging from acoustic guitar to accordion to Tibetan singing bowl. Orbit Service has shared the stage with musical visionary Edward Kaspel, as well as The Legendary Pink Dots, and Phillip Western of Skinny Puppy/Download. Twilight is a journey through lavish, woeful soundscapes populated by jilted lovers, sleepless nights, and friends that are friends no more. Masterfully arranged and orchestrated, the album envelopes the listener in a seamless world of soaring peaks and dismal, barren wastelands. Hope is absent, and the anger of youth has been replaced by melancholic acceptance of the world's hastening plummet at the hands of man. The album's pristine production, handled by both the band members and Grammy Award-winning engineer Matt Sandoski, blurs the line between listener and performer. Around every bend are sonic explorations that create a moving and shared experience. 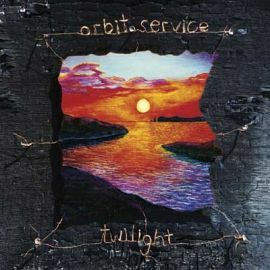 “On Twilight, Orbit Service's sophomore album, the experimental Denver quartet creates a mournful, decaying soundscape out of a series of musical vignettes: gently plucked acoustic guitars tangling with their distorted, plugged-in counterparts; squalls of feedback brushing up against a simple, almost rote piano figure; and skin-crawling basslines swimming beneath jazzy high-hats and chiming guitars. The disc, 11 tracks that flow together as a single piece, is a marvel of mood and creepy ambience. Orbit Service`s intricately woven lament, with echoes of Pink Floyd and the Cure‚ is a wonderful, if haunting, journey.